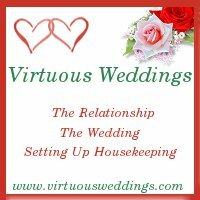 Want to link to Virtuous Weddings? Well, thank you. I'm honored! You may use one of the following banners or buttons. Do not link directly to the images. 2.They may not be altered in any way. 3. They may only be used on family friendly sites. 4. Users must have (and their use of these graphics must express) goodwill toward Virtuous Weddings. 5. Banners used in forums in any way must be used in accordance with the rules of the forum. 6. The image must be linked to http://www.virtuousweddings.com. If you wish to link to a sub-page please e-mail for permission (permission to link to Planning the Wedding, What Shall We Wear, and Dressing the Bride already granted–no need to contact me about those). If you are unable to link the image, include a line below the image (with the url linked, if possible) something like this: Image from www.virtuousweddings.com OR Image courtesy of www.virtuousweddings.com, etc. 8. Save the images and upload them to your server. Do not link to these images!